At the beginning of Spring all the sawdust in the chook yard was shovelled out and most of it used to make beds for the tomatoes and melons and some put aside for use in other vegetable beds. After nearly 12 months of being scratched and manured by the chickens it was full of nutrients and well broken down. Finally this week it was replaced with fresh sawdust, 150-200 mm thick. If it is made too thick it forms a hard pan and needs to be chipped part way through the year to ensure it is fully aerated and exposed to droppings. The easiest way to obtain sawdust is from any nearby sawmill by the truck load. 20 cubic metres lasts many years as long as there is somewhere to store it. Luckily in this area there is also a small holder with his own mill who cuts the odd log. He happily lets you take his waste for nothing. He even loads your trailer with his bobcat. One of the advantages of having a few acres is the space to use a tractor, and one of the advantages of a tractor is its ability to have an hydraulic bucket on the front. One of the advantages of a hydraulic bucket is the ability to move large volumes of sawdust. There is nothing like a little mechanisation to speed up tasks. The tractor has a slasher attached partly to counter balance a full bucket and partly because it is the most used implement. Rather than remove the slasher to tow the trailer of sawdust to the chook run there is a tow ball welded to the slasher. This makes quite a long train moving through the orchard, but it works. It is also useful to have one end of the chook run opening completely with a large, hinged panel. The panel is large enough to enable the tractor loader to fit through. 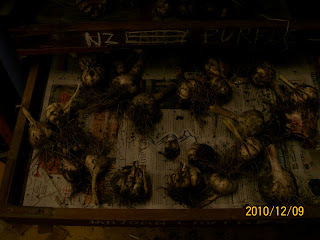 The annual supply of garlic was harvested this week. Looking at some of the varieties it seems we may have left a couple a little late as the corms had split open. Some of this is due to the wet conditions. There are seven varieties we have collected over the years. Some have been found in supermarkets and some through seed suppliers. Mainly we keep the purple (tinged) varieties because they have higher levels of allicin – the stuff that is good for health. There is some variation in corm size. Since the beds were identically prepared this must be just a seasonal variation. We always plant the largest bulbs to ensure we maximise the end result. With a property resplendent with rocks no matter how many are removed to a rock repository, more seem to emerge from the ground. These sneaky little beasts cause the ride on mower a lot of problems. Not so much it seems in blunting the blades as in curving the blades upward. The end result is a very poor cutting edge. A simple solution has been to grip the leading edge of the blade in a shifting spanner and twist the blade back to horizontal. A little angle grinding also helps provide an edge. After every mowing, some time is spent digging out newly exposed rocks with the hope that one day they will stop growing. 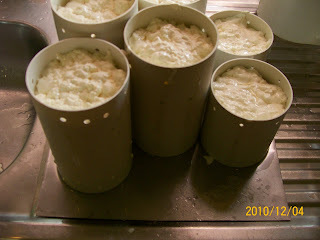 As an extra treat for Christmas, some camembert was made this week. About 12-15 litres of raw milk resulted in 15 small rounds which should be just about ready in time for Christmas day. At the very least it will be pleasantly edible even if it hasn’t reached that runny stage. Normally the mould spore added would be Penicilium Candidum but just for a change Geotricum Candidum was used. Because of the change, the recipe was followed meticulously. Past experiments have involved using the Brie recipe but the Camembert size small rounds. That blend has worked well for us. However, when trying something new for the first time, past results have shown it is always better to be exacting with the first trial batch before deviating. Once made, the small rounds need a humid environment in which to mature. Refrigerators will dry out anything left uncovered. 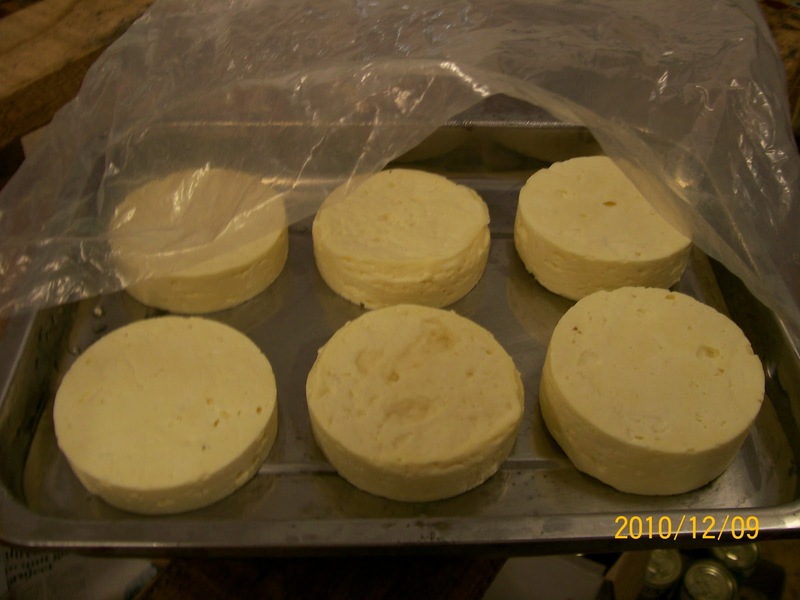 The solution is simple: place the cheeses on a tray and place the tray inside an air tight plastic bag. Seal the bag with a couple of twists and a twist tie. The moisture in the cheese will provide sufficient humidity; if it doesn’t just put a table spoon of water in the bag underneath the tray. The bags can be cleaned in the washing machine and reused many times. A nice big slice runny Camembert on some toast, with a glass of chilled wine is a most pleasant experience. Unfortunately, once it ripens, there is only a short period before it begins to get an ammonia smell and then sadly for us and happily for the chickens it is consigned to the girls. Progressively we have reduced the number made and increased the frequency to try and balance this situation. In addition, eating a few just that little bit earlier has provided some longevity in consumption. The cheese fridge is reasonably full at the moment. 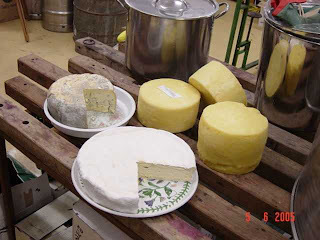 The door has 7 Parmesans aging while in the shelving there are a few Swiss and Cheddars maturing. As always, a goodly amount of Fetta is in a light brine – this keeps very well and is easily made in large batches. As Summer is with us and tomatoes are coming on, a reasonable amount of Haloumi is on hand. Again, this is one that keeps very well in its brine solution. A short soaking in water removes much of the salt and then fried both sides so that it gets a little golden brown provides a nice topping to thick slices of fresh tomato. It has got to be one of the best Summer nibbles around with the harder texture and saltiness of the cheese balancing against that enticing tomato smell and flavour. Previously there was a mention of an invasive weed that appears to have held back the growth of the 4 year old asparagus. Well, the non chemical solution seems to be working as far as removing its presence. Initially, a number of hours of thorough weeding were completed, then on successive days much less time was spent going over the bed as a follow up, picking out any roots that were missed. Starting with a daily weeding in the first week, moving to weeding every couple of days for another fortnight, and then once a week. Finally, it is now just casting an eye over the bed for the telltale leaf structure and spot weeding as necessary and carefully following the root down until it is completely removed. The edges of the bed have been closely examined and weeded to depth. It appears this constant harassment has weakened the plant to a point of near extinction. The asparagus has suffered a little with having some roots disturbed and occasional minor damage to the crown. Hopefully it will now be free to grow robustly for the remainder of the season. To ensure maximum benefit no further picking was conducted allowing all energy to go towards plant strength. As always happens at this time of the year, there is a surplus of cucumbers, beans and zucchini. Many friends also grow vegetables, these three are not in short supply with them. Fortunately there are always a few city friends who appreciate a gift of fresh produce. 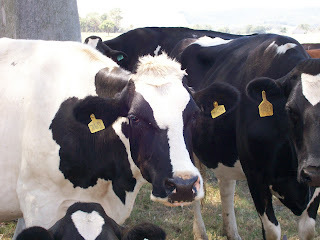 The cattle have developed a taste for fresh garden produce and have no trouble eliminating any bumper harvest every day. So tasty are these vegetables, they’re whipped straight from the hand with a long, snaking tongue. It’s good to see nothing being wasted. While speaking of cucumbers, it is only fair to mention the Japanese Climbing Cucumber. This incredible plant grows relatively slowly, as does its fruit. The fruit reaches large proportions at maturity, in the vicinity of 400 mm. Until it reaches full size, the seeds are still immature it is delicious and tender. After having made the generalisation that no recipes will be published in this blog unless they are simple and delicious it seems that the very next posting will contravene that rule. But, this recipe is incredibly delicious even if not all that simple. It can be made in large batches and stored in small jars and eaten in smaller amounts to spin out the supply so the memory of the hard work involved fades. It goes really nicely with meat. The recipe comes from Gay Bilson’s book Plenty. Peel (we don’t) the tomatoes and roast in olive oil for up to 3 hours at 200 degrees Celsius. Don’t roast too many at once otherwise the steam will stop the roasting process. They should be dark and almost dry. Blend all the remaining ingredients and simmer the resulting paste for up to an hour. Add the tomatoes and their roasting oil. Add more oil if necessary.